Anime Reviews: Toriko Episode 01 – The Undiscovered Giant Beast! 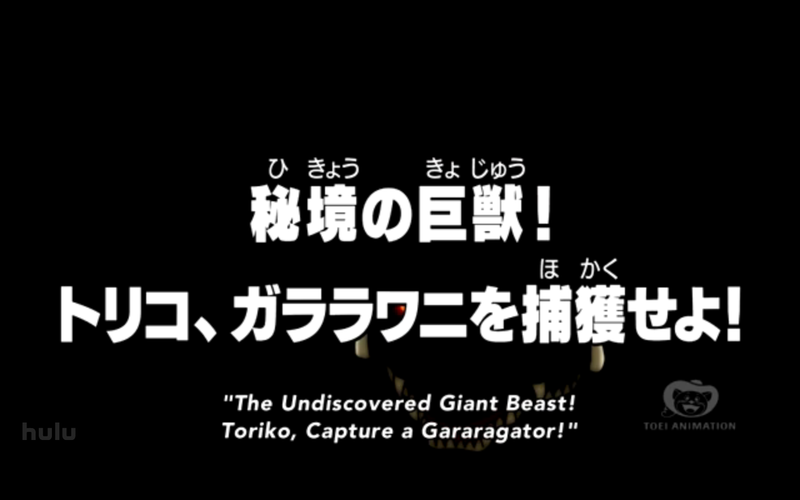 Toriko, Capture a Gararagator! And here I thought it was just One Piece that had those weird titles. 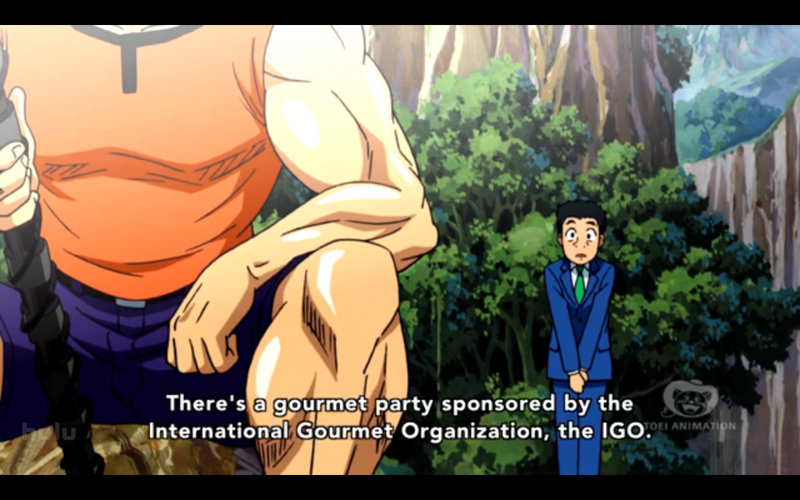 Looks like it’s actually just Toei’s trademark. Also, I would like to point out that I think this series is making me fatter. And I haven’t even read or watched it yet! Just hearing all the hype about it has made me start to make food bigger, and better. 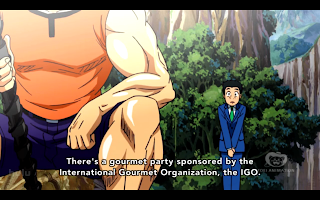 The first thing that comes to mind while watching the first episode of Toriko is, “Holy Crap this is manly!” The protagonist, Toriko, is a gourmet hunter whose physique is so ripped that he almost looks like a parody of later Dragonball Z artwork. Or Fist of the North Star. 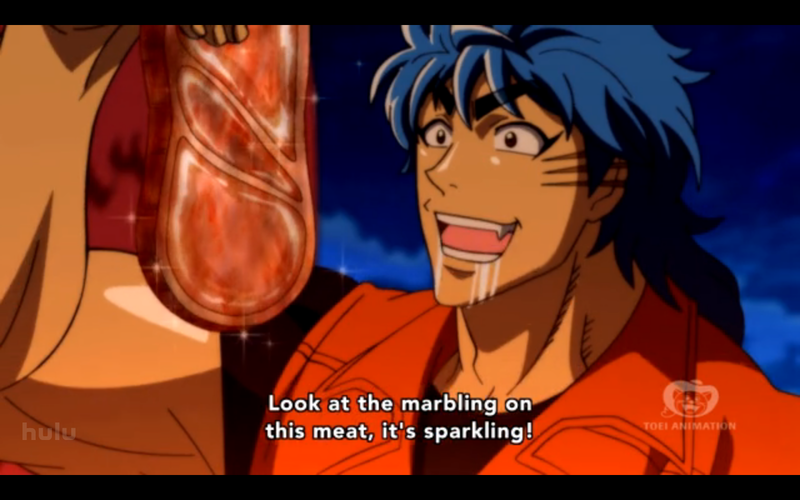 The go to anime everyone thinks of when they think of badass muscle men doing badass things, like firing off planet destroying energy beams, or exploding heads. And then there’s Toriko, who beats up monsters and then eats them. 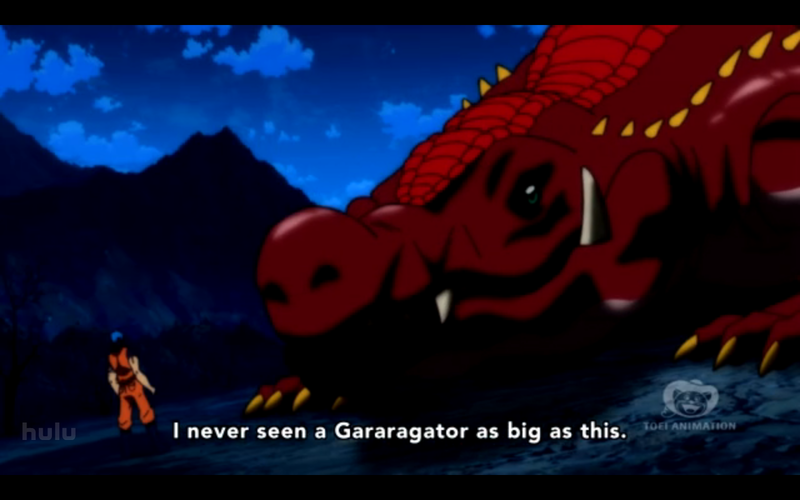 Rather than going into much exposition, other than a brief intro about the fact that people in this world like to eat, and that there are a ton of monstrous animals said people like to eat, the episode skips right into the action. 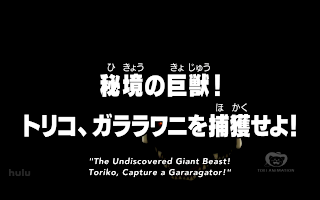 I get the feeling that Toei expects anyone watching this to already be familiar with how shonen anime works, allowing them to skip right into the meat of the series. 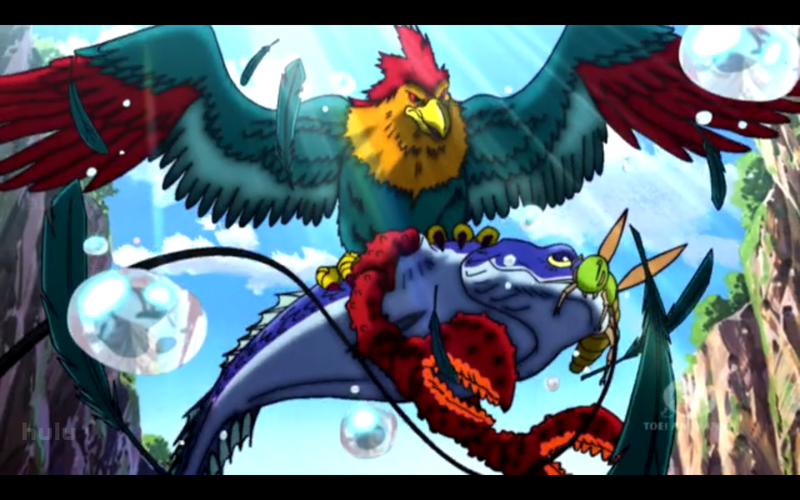 The fight scene at the end of the episode–of course there is a fight scene, this is shonen, what better way to take out a dangerous animal than with your bare fists! ?–is different from anything I”ve seen before in other fighting series. 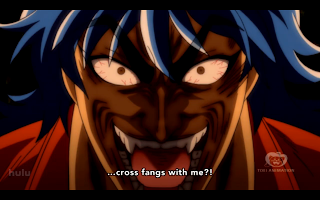 Since Toriko has to fight a giant gator, rather than another human being/alien/demon, I find myself drawn into this series more than with any other fighting anime. 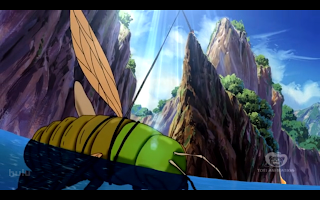 Novelty is a strong selling point of this series, in a market saturated with the same old same old shonen anime, I see this one becoming a big hit. Heck, I can even see it changing lives, maybe not for the better, but change will happen nonetheless. Like I said, my food has been getting bigger and better, and I even enjoy cooking it myself. 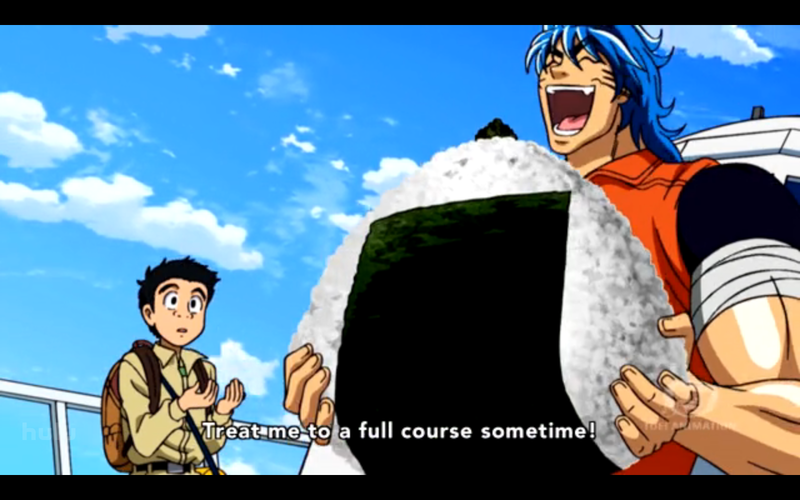 Everyone loves food, so everyone should find at least something to like about this manga. Also, since it seemed most appropriate to announce during my first review for a series entirely about food, I have launched a new blog. I thought of this idea a while back, while eating at the place I reviewed first, and realized that I liked food, and I liked sharing my opinion on the internet. So Eatery Evaluation was created, and the many, many possible reviews sat in limbo while I struggled to keep on top of just one blog, while keeping on track with school. I can’t promise how often I’ll update the blog, and it really is only relevant for people living in the Utah Valley area, since most of the places I review are there. But if you like food, and like reading about good food, or horror stories about bad food, then come on down and give it a look. In case you missed it, the name is Eatery Evaluation!